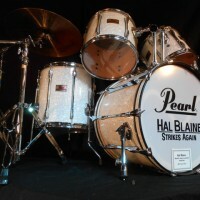 Pearl 1980s White Marine Pearl over maple shells. 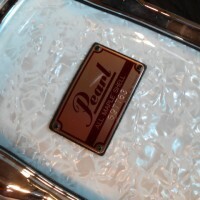 Includes all drums and hardware in photos. 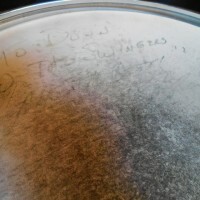 Cymbals are not included but available separately. 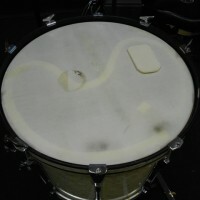 22×16 bass, 12×10, 13×11, 16×16 toms, 6.5×14 free floating brass snare. 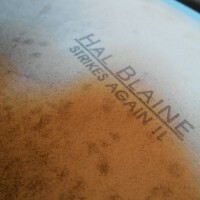 “Hal Blaine Strikes Again” logo bass head. Calf skin bass batter head. 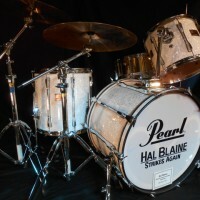 Used by Hal Blaine for recordings and live performances during the 1980s. 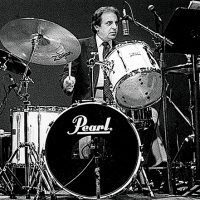 In most instances Blaine used the set with only one 13″ mounted tom as seen in the second photo. Acquired directly from Blaine. 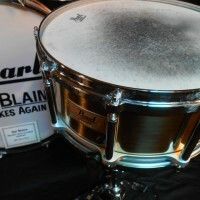 Snare head and COA signed by Hal Blaine. PRICE, $ ON HOLD, SINGLE CLICK PHOTO TO ENLARGE.